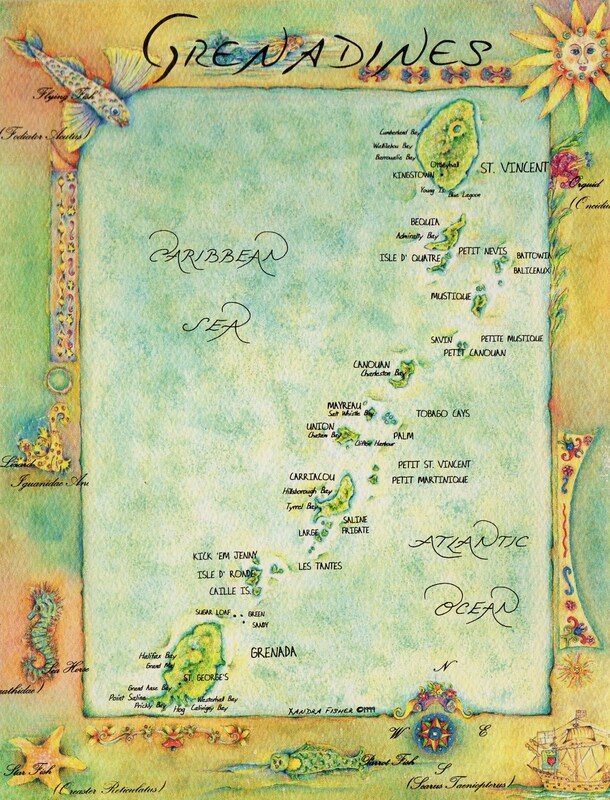 This handpainted watercolour map of the Grenadines in the Caribbean Sea just invites your imagination. The colours of the frame conjure the clear turquoise waves lapping at the soft white sandy tropical beaches… Home to the stunning Tobago Cays National Marine Park, the islands are particularly noted for their scuba diving and watersports and are a luxurious haven that is worth the extra expense. As only 9 of the 32 islands are inhabited, they make for beautiful scenery to sail around and explore. The way in which this postcard is made could not be rendered by any scanner or printer. In my opinion, there is something special about the handmade things, especially those coming from mysterious places, such as this one.